Fortunately, Jeannine and Angela, who I had agreed to meet at the Tuolumne Meadows store, had gotten a camping spot in the T. Meadows campgrounds. Even in September that is no easy feat, because after the campgrounds in Yosemite, T. Meadows is one of the most popular spots in the park. I was happy, because I was feeling rather tired and exhausted after my Mills/Abbot climb and was looking forward to retiring early in my sleeping bag. The two-men (women) tent had already been constructed in superior expert manner by Jeannine and Angela, but I still had to put up my bivy tent, which was fairly straightforward (I should congratulate John on this great purchase). We got the campfire going, and ate dinner in front of it. The whole campground had been picked clean and there was not a single branch left on the ground and thus our purchased bundle of wood only kept us warm for a couple hours or so. It was getting colder and colder (the temperature was to drop to 26 degrees Fahrenheit over night) and shortly after 9pm I crept into my sleeping bag and more or less slept through until 7 am the next morning. We broke camp fairly quickly and drove along CA-120 to a nice and sunny pullout near Tioga Pass for breakfast, which was highly enjoyable due to the variety of foods J. and A. had brought. After breakfast we drove on and arrive at the Virginia Lakes TH at around 10am. We started out hiking soon after getting to the trailhead and only meet one other hiker and a group of cowboys on horseback along the trail. Jeannine again got compliments for her cool hairdo and was actually asked if she was a Buddhist. The cowboys turned out to be representatives from the local cattlemen's association, but I never figured out if their trip was for pleasure or business. Soon into the hike, we had our first views of Black Mountain. On a memorable trip in May of 2006, I had actually climbed Black Mountain, but never seen the mountain or the surrounding countryside, because of low hanging clouds on the way in and blizzard-like conditions on the way out. It was fun to retrace the steps we had taken back then, and it became obvious why we stumbled from high point to high point always finding another, higher point of the mountain when the clouds would open up for a few seconds. We arrived at the pass soon there after and had the first views of Whorl, Virginia, and Twin Peaks, although we could not yet see Matterhorn Peak (later I could). I was a bit uncertain about route finding. A big pile of red rocks to the West impeded a clear view at the route up to the summit and the topo maps did not indicate if it would be better to circumvent the pile or hike across it. I tried the former, but soon had to scramble up some steeper Class2/3 sections for higher ground, which I thought might be more straightforward for J. and A., who by now had fallen behind. I arrived at the highpoint at the pile of rubble and saw the clear Class 1 route to the summit, less than 30 minutes away. But where were J. and A.? After searching the lower slopes of the pile of rubble, I saw them about 200 feet below me. After an exchange of yells, I hike down to them and learned that they wanted to turn around because of the steepness of the slope. Luckily, I had detected a use trail (the one described in the book) and convinced J. and A. to climb a bit higher and to continue their hike on it. However, upon seeing the distance to the summit, both girls grew discouraged and opted to turn around. I suggested that they hike at least to the summit of the rubble (from where the views were very nice as well) before turning around. 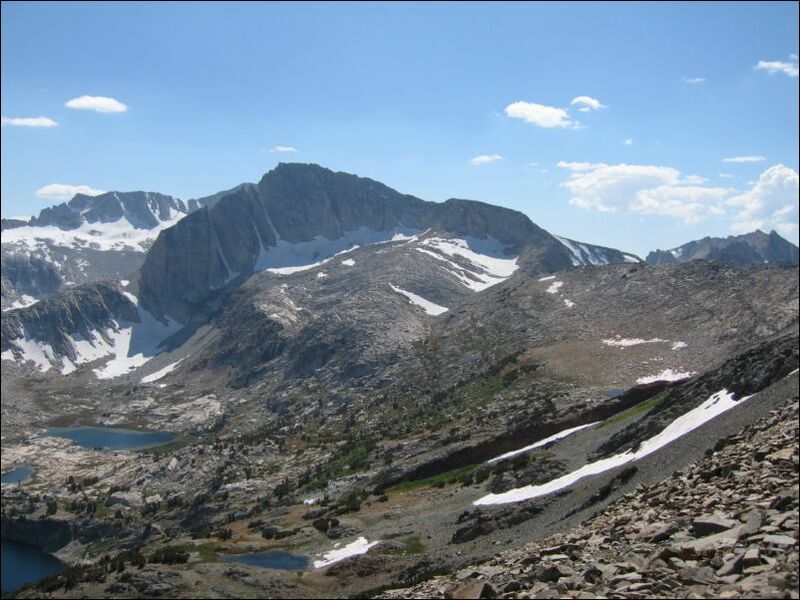 I further suggested that I continue further to the real summit and then descend down to the trailhead a Saddlebag Lakes. The problem would be the car shuttling. A. was not willing to drive back up to that TH from Lee Vining, but agreed to leave my car at the Mobil station near the intersection of CA-120 and CA-395. That sounded like a good plan. Like a madman I worked a couple of sharp rocks to cut through the key chain, so that both parties could take a key, before we parted ways. I sprinted up the slopes to the saddle from where a gradual inclining plateau led all they way to the summit, which I reached at about 1:15pm. Not finding a summit registry I took a bunch of summit pictures (Cathedral Peak was clearly visible as were Lyell and Maclure and Ritter and Banner) and then headed South to the general direction of the Saddlebag Lakes. After ascending and descending a couple of ridges (among them Sheperd's Crest) I arrived at steelhead lakes and for the first time clearly saw North Peak with its impressive northwest ridge. It was two o'clock, and I thought it was early enough to still climb North Peak (in front of Conness) via that route and get back to Lee Vining in time to hook up with J. and A. who were going to have lunch there. The climb up the ridge was fun. Some spicy class 3 sections with nice views (and drop offs) to either side kept me on my toes and I soon arrived on the summit plateau from where it was just a fairly short class 1 stroll to the summit. I signed the registry, which was brand new (it had been place there on the same day by Rob Yang a couple of hours earlier. A couple of self portraits later, I descended the east face of the mountain and soon arrived on the trail which brought me back to the Saddlebag Lakes TH just before 4pm. So far so good, but unfortunately, it took me another 90 minutes and two friendly drivers (and lots of bastards who just drove by) to hitchhike back down to Lee Vining. The second ride I got was with a friendly women (artist), who was traveling through the U.S. for five months working on artistic photographic projects. It took us a few minutes to realize that we were both from Germany, although she had been living in London for 18 years and the British accent really threw me off. Back at my car, I bought plenty of Gatorade and stopped only once on the way back to Davis (to soak my beaten body in the Travertine hotsprings near Bridgeport for 15 minutes), where I arrived at 9:35pm. That was a new record driving back. I am getting better every time.